Fish Tales of the Other White Meat Chesapeake Bay rockfish taste absolutely divine breaded and fried, baked in parchment, seared in a cast-iron pan or grilled over hot coals. Fans argue there is no better fighting fish to land than one of these shiny, green-tinged creatures. 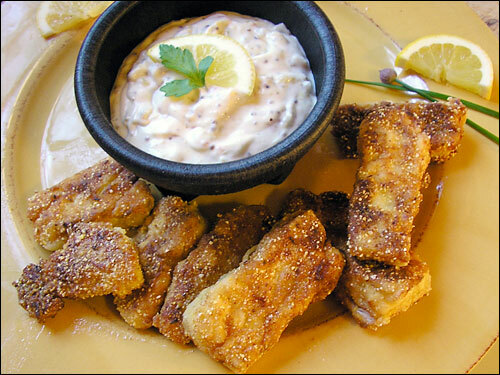 Chesapeake Bay rockfish taste divine simply breaded and fried and accompanied by homemade tartar sauce. Recipes for crispy fried rockfish bites and homemade tartar sauce and seared rockfish filets with mustard chive cream sauce. Food writer and culinary instructor Kendra Bailey Morris is the author of White Trash Gatherings: From-Scratch Cooking for Down-Home Entertaining (Ten Speed Press 2006). Also known as striped bass, greenheads or squidhounds, rockfish have tender, flaky and white flesh. Be sure to debone your fish. Even the best fishmongers sometimes leave a bone or two in, and swallowing a rockfish bone is not a pleasant experience. To locate any forgotten bones, simply run your fingers along the flesh of the filet, gently pressing down. If you feel a bone, take a pair of needle-nose pliers or a pair of tweezers and carefully pull out the bone without tearing the flesh of the fish. Whether you call them striped bass, greenheads or squidhounds, those of us who relish that precious moment where rod, reel and monster fish come together live for catching one these legends of the deep. Never mind that rockfish, as they are called around the Chesapeake Bay, taste absolutely divine breaded and fried, baked in parchment, seared in a cast-iron pan or grilled over hot coals. Fans of the almighty rock argue there is no better fighting fish to land than one of these shiny, green-tinged creatures. Rockfish are members of the Moronidae family, and are characterized by their silver-green-tinted exterior accented with long, dark stripes that run along their sides. An anadromous fish (one that lives in saltwater but migrates to freshwater for spawning), rockfish can be more than 6 feet long and can weigh up to 125 pounds. Rocks are considered a prized sport fish, not only for their size, but also for their fight. Whether you catch your rock while surfcasting with a bomber plug or trolling by boat with a live eel, when you finally land one, you'll know it. And nothing tastes better than rock filets from fish caught that day. 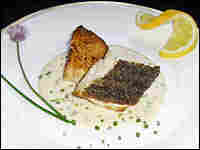 Freshness, along with simple preparation, is key to the gastronomic success of this flaky, white-fleshed fish. Whether you've caught the rock yourself or picked up a pound or two at the local fishmonger, breaded rock with piquant sauces, grilled filets simply dotted with butter and a slice of lemon, or baked whole fish stuffed with fresh herbs is all you need for a perfect spring supper. It wasn't that long ago that I landed my first, big rock while fishing the freshwaters of the lower James River in Richmond, Va. Every spring, rocks begin their spawning run from the ocean and Chesapeake Bay into the freshwater, tidal rivers, and it is during this time, when the waters start to warm, that these typically lazy feeders are a bit more active. It was one of those unusually hot, humid late-May afternoons we often have in Virginia, and I'd spent much of the day shore fishing for another hefty, trophy fish — the jumbo blue catfish, or blue cats, as we call them. The river had flooded a few days before, so the water was high, and I was up to my ankles in receding mud. The horseflies were biting, the sun was burning, and I was tired of reaching into my half-rotted plastic bin of slimy chicken livers for bait. I grabbed one last liver, slid it onto my hook, and quickly checked my split-shot sinker weight to make sure all was intact. Then I cast out for the last time that day. I watched the burgundy-colored liver sail into the air and gently plop behind a large rock, swiftly sinking into the moving water. I slid over my foldout chair, cracked open a beer, and settled in to do what we all do when the fish are slow and the day is long — wait. Yet, just as I was about to take my first sip of lukewarm beer, I felt it: a little jiggle, then a tug, then whoosh. My line began spinning away from my rig at an incredible rate, and my rod suddenly curved hard toward the water as if I had a 20-pound weight attached to its end. I loosened the drag, letting the fish take it out, so my line didn't snap. I pulled back and futilely reeled in as hard as I could. In that moment, I felt powerless, yet I knew I was in the presence of something truly remarkable. After many minutes, the fish began to tire. Little by little, I dragged my trophy toward the shore. As I pulled the fish closer, I could see her glistening green-gray body and trademark black stripes emerge from the water's surface. She was turned on her side, her one eye staring up at me, uncomprehending, yet still seeking reprieve. I gently removed the hook from her mouth, and pushed water through her gills, and in a split-second she effortlessly darted away. That was the first and last time I caught a rock that size. As much as I wanted to keep her, this was a time when anglers released their catch, doing their part to help a dwindling rockfish population bounce back. And it worked. Today, the Chesapeake Bay rockfish population has increased dramatically. Every time I tell this story, the size of that fish gets just a tad bigger. Maybe this is why so many of us love to fish, so we can transcendentally connect with the mysteries that lie beneath the water. And, when we finally sit down to partake of the day's catch, we can all find reassurance in knowing that every fishing day has the potential to end with a tall tale and a good meal. Read last week's Kitchen Window: Swiss chard. One of best ways to serve freshly caught rockfish is also one of the most simple. Immersed in tangy buttermilk and then lightly breaded and shallow fried, these tasty fish nuggets are crispy on the outside while moist and juicy on the inside. Many Bay locals like to fry their fish in a mixture of peanut oil and bacon grease (we keep our grease in a covered bowl next to the stove for easy access), which creates an extra-crispy coating and lends just a hint of smoke flavoring. 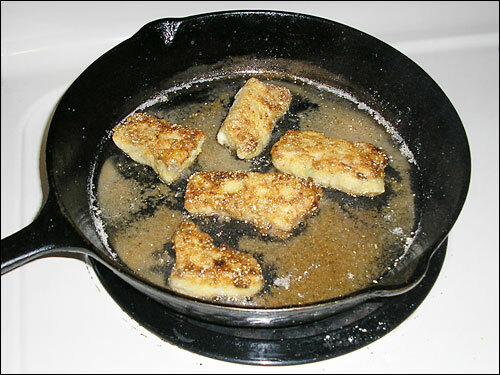 Preheat a large fry pan, preferably cast iron, to medium-high. Add peanut oil and bacon grease up to 1 1/2 inches deep. Mix together in a shallow dish cornmeal, flour, cayenne, salt and pepper. Pour buttermilk into another bowl. Add fish bites to buttermilk and let sit for about 15 minutes (or up to 2 hours in the fridge. 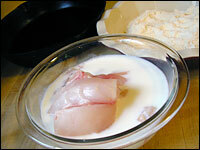 Then coat fish in cornmeal mixture, shaking off any excess. Once oil is hot (around 375 degrees), add fish, being careful not to crowd. Fry fish until golden, about 2 to 3 minutes per side, depending on the thickness of your filet. Remove fish to a wire rack to drain. Sprinkle with additional salt, if desired. To keep fish warm, place in a 200-degree oven. Serve with tartar sauce, lemon wedges and hot sauce on the side. Mix all together in a medium bowl. Cover and store in refrigerator until ready to use. Best made a day ahead. Keeps refrigerated up to 3 days. The simple preparation of this dish allows for the mild, buttery texture of the rockfish meat to truly shine. Seared in a hot pan, the crispy skin creates a lovely crunch that offsets the creamy richness of the accompanying sauce. In a small saucepan, boil shallots, white wine and champagne vinegar on medium-high until most, but not all, the liquid has evaporated, about 4 to 5 minutes. Turn down heat to medium and whisk in heavy cream and mustard. Whisk constantly until mixture reduces to about 1 cup. Strain sauce into another saucepan, pressing down well on solids. Discard solids and return saucepan to medium-low heat. Add chives and season with salt and pepper. Turn heat down to low and whisk in butter. Remove sauce from heat and keep warm until ready to serve. Score the outside of the skin of each piece of rockfish two or three times, careful not to cut too deeply. Pat fish dry with a paper towel. Season both sides of fish with salt and pepper. Set aside. Preheat a cast-iron skillet to medium-high. Add butter and peanut oil to skillet. Once pan is hot, place fish, skin-side down, in pan and sear until the skin is nice and crispy, about 3 to 4 minutes, depending on the thickness of your fish. Carefully turn fish over and continue to cook 2 to 3 minutes or until fish is done to your liking. Continue cooking fish all the way through in a 350-degree oven if your filets are extra thick. Spoon about a 1/4 cup of sauce onto a large plate. 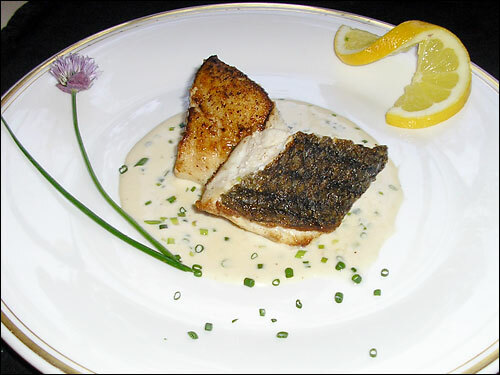 Place rockfish filet on sauce, skin side up so it doesn't get soggy, and garnish with additional minced and whole chives.